The whole team at Raptor Politics wish to extend our sincere thanks to all our followers, both here in the UK and abroad, for taking an interest in what we have to say about the plight of Britain’s birds of prey. Raptors throughout England’s northern uplands continue to experience terrible times, the result of their widespread persecution to protect red grouse stocks which are then shot for sport. The situation we blogged about in September 2013 where we highlighted the collapse of all but a single breeding pair of peregrine falcons from within Lancashire’s Forest of Bowland tells its own tragic story. Although five breeding attempts were made this season, once again only a single pair of peregrines succeeded in producing any young. Since 2010 the number of abandoned peregrine territories throughout Lancashire’s Forest of Bowland has been reduced by 15 pairs. This position is unlikely to improve anytime soon under England’s present Tory Government who have rejected the calls to implement the new law of (Vicarious Liability), which would make estate owners responsible for the illegal actions of their gamekeeper employees. The peregrine eyrie containing 4 chicks shown above was destroyed 3 years ago after criminals removed the nesting ledge ensuring nesting peregrines could no longer breed at this important historical site. In addition to this single nesting site, 4 more Bowland peregrine nesting sites have also been treated to similar destruction making their use in the future unlikely. What is being done to counter this criminal activity, nothing, nor are the losses being officially recorded. Lets just hope that eventually common sense and improved enforcement of wildlife legislation may begin to turn matter around in favour of the few raptors that remain. We must not forget that this year witnessed the loss of two of Bowland’s fledged Hen Harrier chicks, ‘Sky’ and ‘Hope’, which both disappeared just three miles from their natal nesting sites within weeks of fledging. Both harriers were presumed to have been shot. 3 comments to Christmas and New Year Greetings from the Raptor Politics Team. 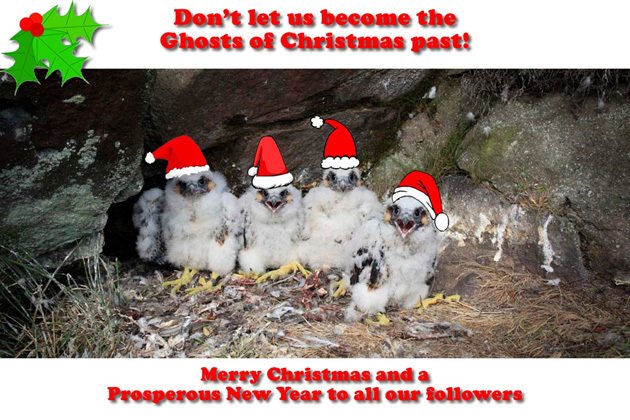 Your Xmas present will be getting your licenses back to help restore raptors back into Bowland!! It is not the Birds of Prey that need monitoring in the Forest of Bowland, It is those that are responsible for the disappearance of the Birds of Prey..Follow the hunter not the hunted. Merry Christmas to all at Raptor Politics and best wishes for the new year. I sincerely hope that 2015 will be the year wildlife protection in England finally delivers for our raptors the safety and justice so very terribly lacking.